More and more, archaeologists are finding proof that Biblical stories relate to historical events. The amazing tale of the tablet is told in a series produced by the Smithsonian. For scholars, the tablet offers proof that the Tower of Babel wasn't just a work of fiction, the series argues, but "an actual building from antiquity." The sixth-century BC tablet, found a century ago but, as part of a private collection, never studied or exhibited until now, depicts a Babylonian tower known as a ziggurat. 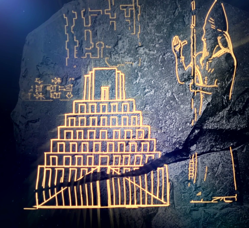 After deciphering the tablet, Dr. Andrew George, an expert on ancient Babylon, became convinced it shows the true source of the famed Biblical story.